Saturday we started down to the San Diego Wild Animal Park but got caught in heavy traffic outside of San Juan Capistrano so we diverted off the freeway to do a little antiquing. We had fun, and managed to resist purchasing any junk, despite Chris falling in love with a 500 year-old, 7-foot tall, $12,000 Chinese Warrior statue. He thought it would have made a nice addition to our living room. Add some ambiance. We also discovered that Andrew and Cam were available for dinner so we headed back to Tustin/Santa Ana/Anaheim for some good company and awesome Ma's Chinese Islamic food. Pure deep-fried, artery-clogging goodness. Afterward we headed off to see Tropic Thunder. Not typically my type of humor but actually ok (mom and dad: probably not a movie that you would enjoy). Look at that lovely California blue sky. ...and then headed up to Long Beach to meet up with Heather and Mindy for the Grunion Run. Say what?! GRUNIONS! (wiki here. Or check out Chris' alma mater's site). 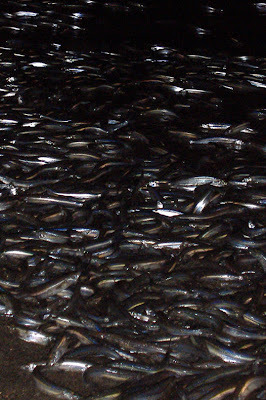 Grunion are known for their very unusual mating ritual. At very high tides the females come up on sandy beaches and dig their tails into the sand to lay their eggs. A male then wraps himself around the female to deposit his sperm. For the next ten days the grunion eggs remain hidden in the sand, but at the next set of high tides the eggs hatch and the young grunion are washed out to sea. 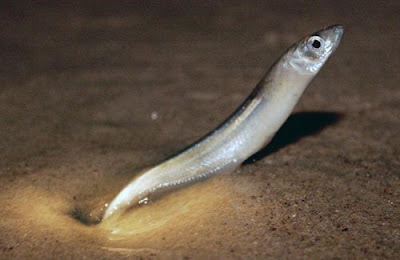 Grunion typically spawn in the thousands (picture source here).. ..but it was a slow night and we only saw about 10 fish flopping around on the beach. You are allowed to catch them (provided you have a fishing license) and some kids showed us their nightly haul. Let's find some grunions! We arrived around 10:45 pm and stayed until the cops kicked us out around 12:20. This was the rock that we (Heather, Mindy, and I) were absolutely convinced was a grunion. We were bummed when we discovered it was only a rock. Yeah, it doesn't look anything like a grunion. Some seaweed. It's pretty crazy to have this stuff brush up against you while standing in the water. It's pitch black outside and it clings and pulls at your legs. It gave us all the heebie geebies. Mindy and Heather. Group de-sanding. Chris looking for grunion. Fun night, despite the lack of grunion hordes. Here is the website for CA's Fish & Game and the place to look for next year's grunion schedule. Today is a lazy day. We didn't get back from Long Beach until the wee hours of the morning and consequently didn't feel bad about sleeping in this morning. Chris finally dragged himself off to work while Bailey and I are blogging and doing random house stuff. A good weekend.